CLEVELAND, OH (WOIO) - For the seventh year in a row, hundreds of Cleveland school students are finding their zen. 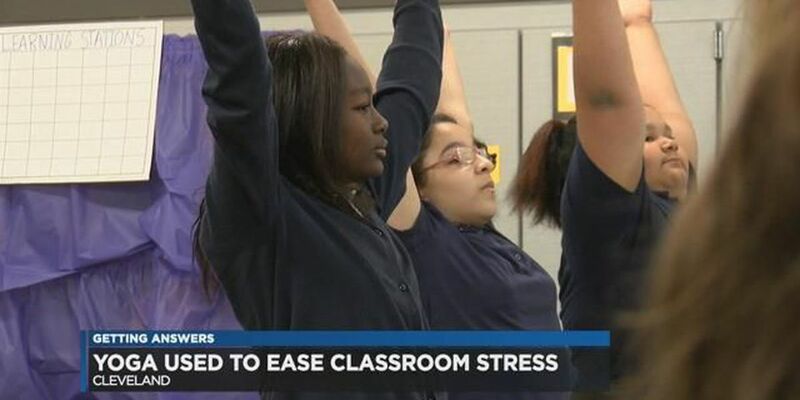 Twenty-one Cleveland schools offer some students the chance to learn yoga. The non-profit organization ZENWorks Yoga provides the classes free of charge through donations and gr ants. The demand right now exceeds the spots that are available, so some schools purchase an online subscription to classes for students so they can log in and follow along on their computer screen. Sonya Patel, who is originally from Cleveland, got the idea for ZENWorks when she was teaching in the inner city in New York. "I just noticed the amount of stress and anxiety and anxiousness that my students carry with them, and being seven, eight, nine years old, I just felt like it wasn't fair. So, I started doing a little bit of yoga with them - just doing some light exercises, some poses, breathing exercises, and I noticed it made a difference," said Patel. When Patel moved back to Cleveland, she started ZENWorks Yoga. The skills the students learn are priceless, but are especially important for many kids living below the poverty line. "Our goal is to teach our kids how to self-manage, how to self-regulate, how to work with impulse control, how to be kinder," said Patel. When 10-year-old Yandel Aponte first heard he could do yoga at his school, Wilbur Wright Elementary, he admits he couldn't believe it. "It was actually a surprise. I didn't think that they would do it in school," said Yandel. "Some students would be angry, but then when we did yoga they would be like calmed down," said Cayla Hines. Yandel says he notices a difference in himself. "Makes me feel mostly calm," added Yandel. The goal is to eventually be able to offer all students in the Cleveland School District the opportunity to take yoga classes.